Over at Inchy by Inch challenge blog this weeks theme and final for the year is Christmas Carol. 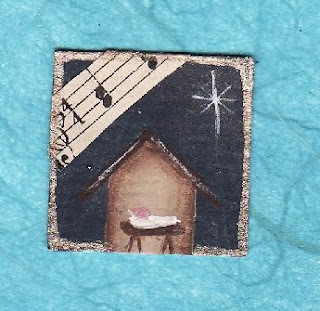 I decided to paint my inchie, I was in a miniature painting mood today and I decided to paint this to reflect one of my favourite Christmas carols, Away in a Manger. Remember the true meaning of Christmas, it really didn't start with good deals at Walmart or Best Buy but rather a tiny babe in a manger a gift to all of us from God. I would like to thank Fiona the hostess over at Inchy by Inch for all the work that she does to run this fun blog challenge and to all the girls I have met over there that share the same art interests as I do. Terrific inchy. It is good to keep in mind what the season is really about. You did a great job of miniature painting. A lovely inchy - I really like the music in the corner and the tiny little painting! Great work. This is a darling piece. I love it. Cool. Simply beauty. I like this inch very much. You really captured the less than glamorous yet blessed event of that night Les in this tiny piece of art. Well done, perfect.